UNITED NATIONS, December 5 -- Eritrean president Isaias Afwerki had been told he could speak to the Security Council Monday morning, along with his neighbors and accusers, before the Council voted on sanctions against Eritrea on Monday afternoon. Eritrea responded that this was not due process, with the sanctions resolution already locked in and "in blue." Late on December 2 Eritrea's Ambassador Araya Desta told Inner City Press "no one will come" under these circumstances. On December 3 Eritrean Foreign Minister Osman Saleh submitted a letter to this effect. When Monday morning came, there was no consultations meeting on the Eritrean letter. Inner City Press asked US Ambassador Susan Rice on her way in if she thought Eritrea's neighbors and accusers should still speak, if Eritrea wasn't coming. "They could have," Rice answered. Inner City Press asked UK Ambassador Mark Lyall Grant the same question; he replied, "Anyone can speak who has a vested interested." And the interests were vested, piped in by video conference from Addis Ababa. The president of Djibouti spoke about his country's land dispute with Eritrea. The President of Somalia's Transitional Federal Government spoke, and the foreign minister of Kenya which has entered Somalia with troops it now wants put under African Union helmets, and paid by the UN. The AU representative of Uganda, whose UPDF troops already have that status, also spoke. The meeting was suspended after the speakers from Addis; the sanctions will be voted on at 3 pm. 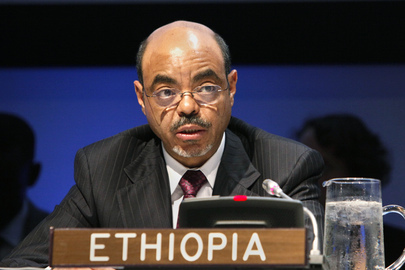 It felt like the sanctions, which Zenawi said were watered down, might be made harsher. "They're in blue," Inner City Press was told. On his way out, Ethiopia's Permanent Representative to the UN Tekeda Alemu stopped to speak to Inner City Press and provide input. He said, "the Eritrean interest was never to have an opportunity for the president to talk." One answer is, how will we know, if such short notice was given, to speak hours before an already in-blue resolution would be voted on? While some on the Security Council described the "compromise" reached on November 30 as innovative and a good precedent -- to invite a head of state to speak -- to do so on such short notice, and to not provide for any gap to consult with capitals and modify a resolution if necessary, is questionable. It ended up with some analogizing it to a kangaroo court, or perhaps a one-sided therapy session like an intervention. Only the intervenee was not present. The vote is at 3 pm. Watch this site.